This week we wanted to give you an update on a few things that are currently out of stock. It's not always easy to keep popular things on the shelf. If you're waiting for any of these, here's your update. 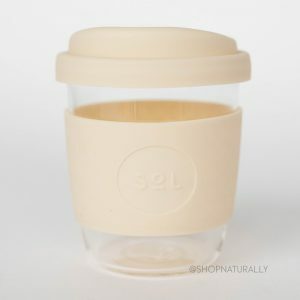 Even though we got a reusable coffee cup delivery from Sol a couple of weeks ago, they weren't able to fill our whole order and some cups have sold out. We do have a pre-order in place for their next delivery, including the pink glass water bottle which is the only colour we don't have in stock. In our last delivery we received 16oz coffee cups and water bottles in black, grey and the deep green colour which are all new to their range. In the 8oz and 12oz coffee cups, a new colour called Coastal Cream is available. I will apologise now for the photographs. We took photos of all the cups and bottles in our own photo studio, but that Coastal Cream is a really hard colour to photograph. It's a pretty accurate representation of the colour, but getting it in focus was just next to impossible. Off to photography school again. The rest of the colours are super sharp! One of the products we find most difficult to keep on the shelves is from our natural cleaning products range and that's the 5L and 5kg products from Abode Cleaning. We have a reasonable amount of space allocated in our warehouse (3 full bays of stock) and when it arrives, it comes in on pallets. Most of the stock is made for us as we order it so it takes 3-4 weeks from order to arrival. As soon as a delivery arrives, we put the next one in and fill the shelves again. This one is a pure labour of love for us as we have to literally move around 2 tonne of stock when the orders arrive and it's a really big job for a heavy and low cost item. We recommend you keep around 4-6 weeks of stock in your own home so when we're low you won't run out. Please, always leave your email address in our stock notification system and we will email you as soon as they arrive. We have been teasing on Facebook again. Vego Spread in Australia is set to be one of the most popular products in the history of our store if the pre-orders are anything to go by (look out Agreena Wraps, Vego is coming for you). It is the palm oil free, fair trade, vegan and crunchy version of Nutella. It's not a health food, it's still packed with sugar. It's the ethical choice for those who are vegan and palm oil free. Packed in to a glass instead of a glass jar, the only waste at the end is the lid. Vego Spread will have strictly limited stock available in Australia until January. We have secured a reasonable amount of stock beforehand with our first delivery due late October and one more in November. We expect the stock to go quickly and will be limiting it to 2 jars per customer until January. Stay tuned to our social media and newsletter to find out when the stock is arriving.